As many of my readers already know, I recently shifted gears from a being a consultant focused on voice to a being network engineer focused on…well, everything. One of the first items on my list to tackle, however, put my years of voice training to good use. A common issue voice engineers are faced with is one way or no way audio. As a voice consultant, those types of issues almost always ended with my saying the line “that’s a network issue, you’ll need to follow up with *those* guys” because almost always one way or no way audio is a routing issue of some sort. Of course, now that I am again one of *those* guys that gets to fix the routing issue too, that line is not quite as charming. Many people who do not do voice everyday are not aware of the fact that the actual audio payload of a phone call is RTP traffic sent directly between the two endpoints. This is starkly different from the call signalling, which is typically between the endpoint and the Unified Communications Manager. Given that signalling and RTP can take differing paths, you can end up with phone calls that seem like they should work but don’t, and for better or worse, the other end cannot hear you screaming in frustration. My most recent run in with this issue involved a new VPN connection setup and users unable to hear voicemail prompts when checking messages. Complicating the issue was the fact that “normal” phone calls – phone calls between the remote and main site, were working just fine. A closer look, however, easily explained why one was working and not the other. A good place to start on a no audio issue like this is to make use of the Question Mark button located on most Cisco phones. In this case I was dealing with a 7960 (don’t judge me) and just clicking the Question Mark button twice pulled up stats for the conversation. Most notably, I could see that the transmit packets were incrementing, but the receive packets were not*. Newer phone models like the 69/8900 series hide this information in some other menu which isn’t entirely obvious, but just check the documentation to see how to pull up phone call stats. You can see in the photo below the type of useful information you can get – note the Question Mark key is in the bottom right of the picture. Having confirmed that the phone thought it was sending RTP packets, but clearly not receiving them, I decided it was a good time for a packet capture**. One of the things I love about Wireshark is how easy tracking down RTP conversations is in a .pcap file. To take the capture, simply plug into data port on the phone, launch Wireshark, start the capture, and make your test call. Then stop the capture, click on Telephony -> RTP -> Display All Streams. You will see the RTP conversations in the capture, choose the one you want, and then click Prepare a Filter to view just the RTP packets you are looking for. Be sure to wave your hand and mumble “these are the RTP packets you are looking for” while you do. Now the conclusion to this episode is not nearly as exciting as the troubleshooting process, adding a route to the VPN configuration to the correct subnet was all that was required, but it serves as a great example of when a voice issue isn’t actually a voice issue, no matter how much it looks like one. *Another item to rule out on these types of remote site setups is the possibility of a codec mismatch. 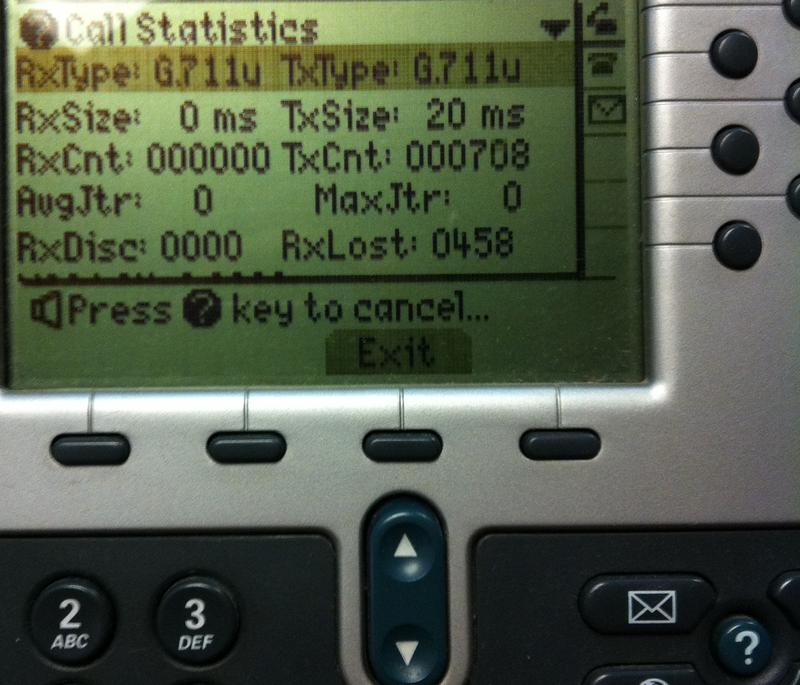 The default between sites is typically g729 and not all voicemail servers can tolerate that. Using the Question Mark key can show you the codec that is being used and then you can investigate whether or not the proper transcoder resources are in place. **Pretty much anytime is a good time for a packet capture. As usual, this is a great writeup Amy. If you don’t have access to physically double-tap the ? button (or have an app to let you remotely do it), you can http to the phone to get the same real-time statistical data. Also, not to criticize your photo, but these phones have an embedded web server with a handful of useful cgi scripts you can invoke. One of the most useful of these allows you to pull a screenshot from the phone via “http://[address of phone]/CGI/Screenshot” (case sensitive). You just have to add the device association as authentication is required. Will, I can’t believe I was a voice engineer for three years and never came across that feature! Thanks so much for sharing, I can think of a number of occasions (besides just blogging) where that would have been helpful in the trouble shooting process! You win the internets for today sir! Hi Amy your post is very good this help me too much, i have a question, we have been experimenting this problems and is because for some reason the rtp packets are going to our internet ip, but we dont know why this happen, where normally should be go the rtp packets? Sorry for the delay. RTP packets will take whatever route the routing table shows to reach the other endpoint. RTP will not flow to the CUCM but instead will flow between the endpoints. One way audio or no way audio is almost always a routing issue between the endpoints. That’s great!! Glad you were able to resolve!! Didnt you have to enable “span to PC port” when you did the pack-cap? yes, that does need to be on for the packet capture, that’s a very good thing to check as well! Another one way audio I’ve seen was because of an MTU on the core switch was saying my RTP was too big as well as some Extension Mobility requests.